The 20-cigar acrylic humidor from Boveda is perfect if you want to show off your cigars and not have to worry about seasoning or maintaining the proper humidity level. This humidor from Boveda provides 12 months of maintenance-free humidity for your cigars and requires absolutely no seasoning. All you need to do is insert the two 69% Boveda packs that it comes with and you're all set. This small acrylic humidor is thick and heavy, with rubber feet so it stays in its place on your desk. The lid rests snug on the body using magnets to provide a proper seal. 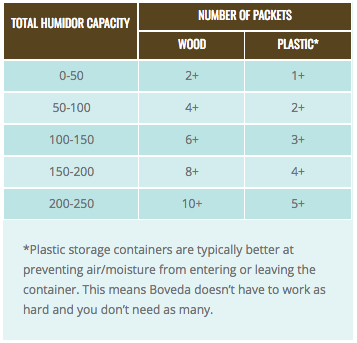 Humidity is generated by way of the two included Boveda 69% packets that fit underneath the perforated acrylic shelf suspended above the floor of the humidor. There is even room to insert a thin layer of Spanish-cedar that you would obtain from a cigar box. In summary, this humidor can be a great way to start out collecting cigars, or if you already own a humidor, this can be an excellent way to showcase some of your finest cigars to friends and family. 12 months of maintenance-free storage for your cigars. Includes two 69% RH Large Boveda packets. Removable perforated acrylic shelf (sits on top of packets). Lifetime Guarantee from the manufacturer (Boveda). We assist you in filing any claims with the manufacturer. Holds 20 Robusto or 12 Churchill or Double Corona. Interior Dimensions: 7 7/8″w x 5 1/8″d x 1.5″h (above the tray). Exterior Dimensions: 8.5″ x 5.75″ x 2.75″.